Travel Size Classic Strategy Game – Get 4 Discs in a Row to Win! 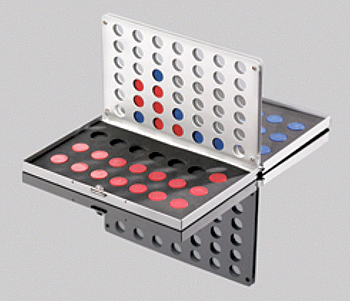 These Classic Stra	tegy Games are travel size, measuring 6-¼" wide x 4" deep x 3/4" high when the case is closed. Each Game features a lightweight aluminum case that folds up when not being used for play. To win the game, simply be the first player to get 4 discs in a row (horizontally, vertically, or diagonally). Sale Price: $4.88. Was $7.50. Save 35%! Feel free to browse our complete line of other Games, including Checkers, Dominoes, and much more! Our Travel Size Mini Domino Sets are another great game for on the go!